Another Moomba has come and gone. 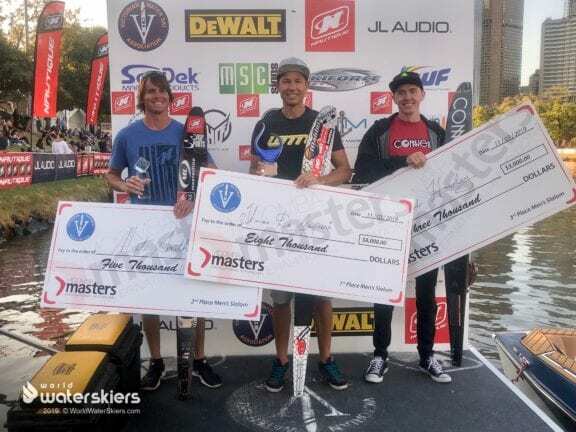 The 2019 Moomba Masters International Invitational was filled with outstanding skiing, shocking upsets and the same magical flair we have come to expect from the Yarra. Let’s begin with slalom. On the women’s side of the action, there was very little doubt surrounding the superb form of Whitney McClintock-Rini (CAN) and her potential to win the event. 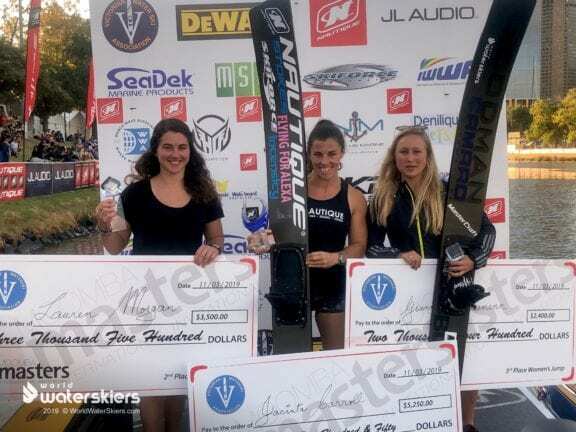 Whitney showed a cool head to go along with her red-hot skiing, comfortably slaloming her way to the Moomba title, finishing with the three largest scores of the weekend. Manon Costard (FRA) skied consistently and claimed second in all 3 rounds, while Siani Oliver (AUS) finished 3rd as somewhat of an underdog. She started out a little slow but brought the heat when it counted, peaking in the finals and securing the bronze in front of the home crowd. 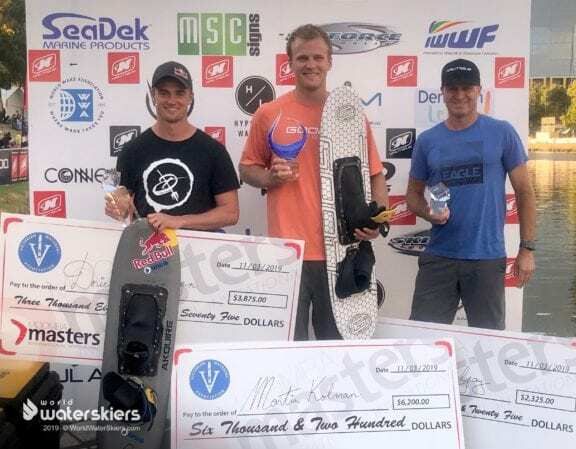 The men’s action seemed to be heading in a very familiar direction as well, with Nate Smith (USA) coming off the dock top seed in the finals. Thomas Degasperi (ITA) posted an impressive 2 at 10.25 meters. 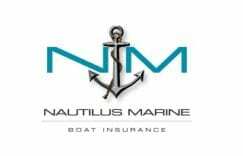 Nate was unable to beat the score outright, but rather tied Thomas and sent the finals to a runoff. T-Gas was the first skier on the water and after watching the other competitors fail to eclipse his finals score half an hour, he found the conditions too difficult to run 10.75 cold off the dock. He finished with a score of 1.5 at 10.75 and seemed to leave no doubt that Nate would simply round 2 at 10.75 to claim an easy victory. 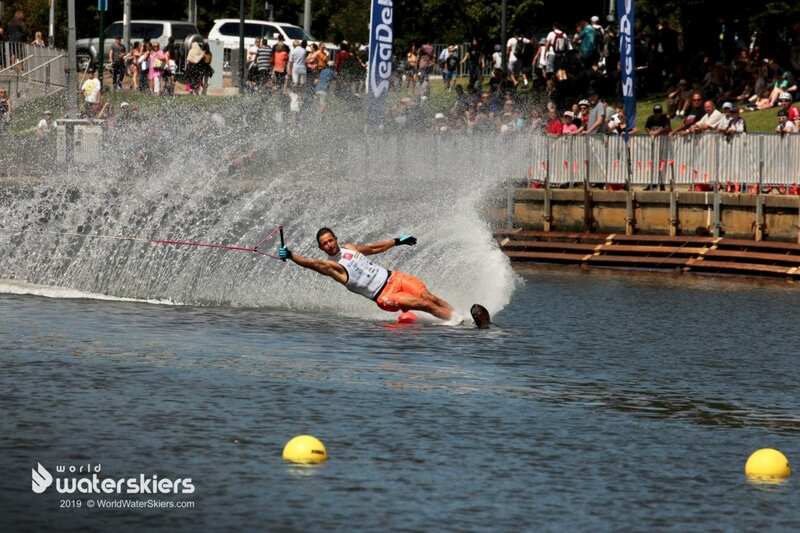 Yet, to the major surprise of the crow, Nate fell around 1 ball and Degasperi was once again a Moomba champion. All so close was hometown hero Joel Howley (AUS), posting a 1.5 at 10.25 to take 3rd. The Men’s action proved to be extremely close, with the river once again showing all the skiers who is really in charge on the Yarra. In tricks, Anna Gay (USA) and Neilly Ross (CAN) continued their back and forth rivalry which has persisted for the last couple of years. Anna claimed the first round, with Neilly turning in the first score above 10,000 points of the event to take round two. But it was Anna who would have the last laugh in this one, peaking little by little each round to finish with a score of 10,040 in the finals. World Record Holder Erika Lang (USA) would round out the top 3 with impressive scores, but off her normal pace just enough to give the two prodigies the edge. 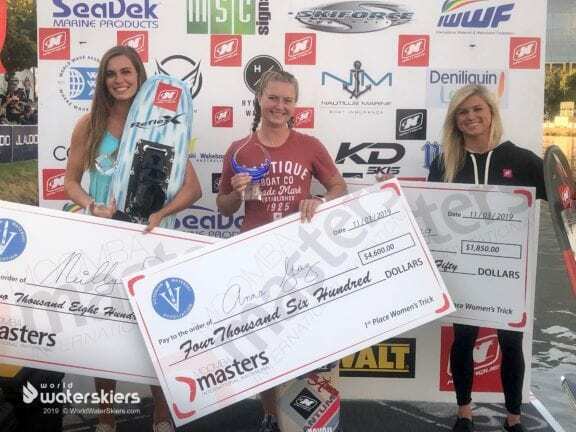 Erika had an impressive 2nd place finish in the wakeboard event, undoubtedly an extremely hard situation, switching between events during the course of a season, let alone in the same competition, but Erika handled it superbly. In the men’s event, Martin Kolman (CZE) and Patricio Font (MEX) shared a similar back and forth nature each round. Kolman narrowly took round one, while Pato showed great consistency with back to back 11,200 point scores and was the leader heading into the finals, with Dorien Llewellyn (CAN) maintaining a hold on the third and final podium spot each round. In the finals, Llewellyn and Kolman each crushed their respective runs, tricking 10,090 and 10940 respectively. With the potential to win so close, yet so far, Pato began to feel the unrelenting presence of the Yarra and described his toe pass as “rolling down a hill, getting faster and faster as I went on”. He sucked an edge on a Toe 5 front, knocking himself out of the title race and earning an invite the US Maters. 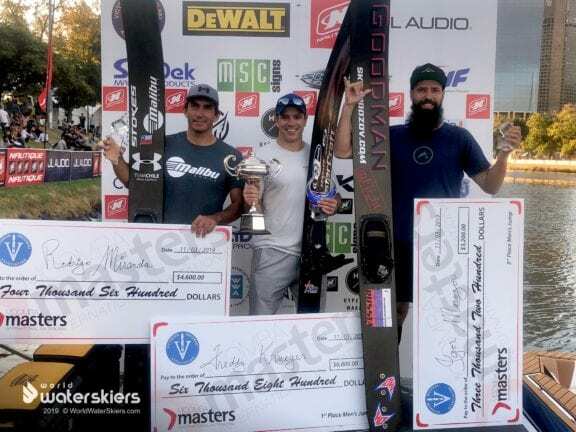 In the end, Kolman, Dorien, and Russell Gay (USA) were the three to receive trophies on the Moomba podium. Jaret Llewellyn (CAN) made his return to the river after a 9 years absence from the Yarra. He seemed to be back, healthy and very comfortable, placing 4th with a 9100, setting history with a father and son in the same professional final. Time will tell if the sporting world will ever see a father and son, or mother and daughter standing on a podium together. 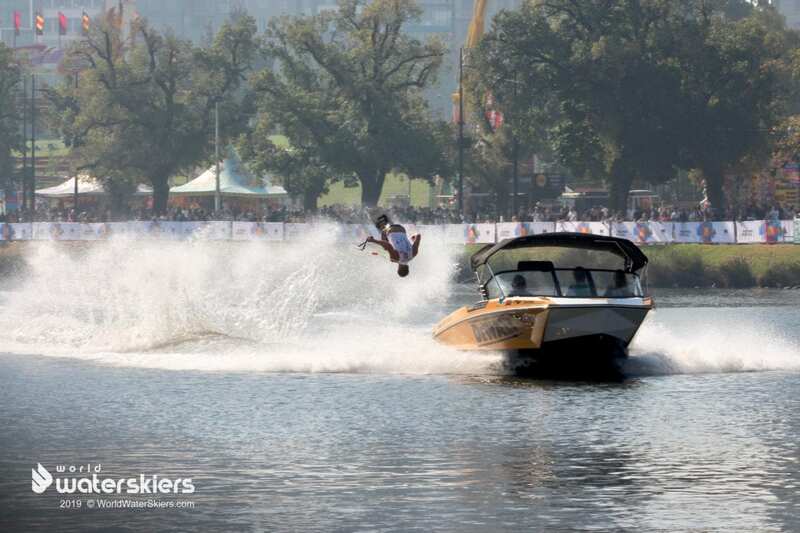 Once again, the little powerhouse from Australia, Jacinta Carroll, aka – Rabbit, took home the women’s Moomba jump crown with a 56m jump. 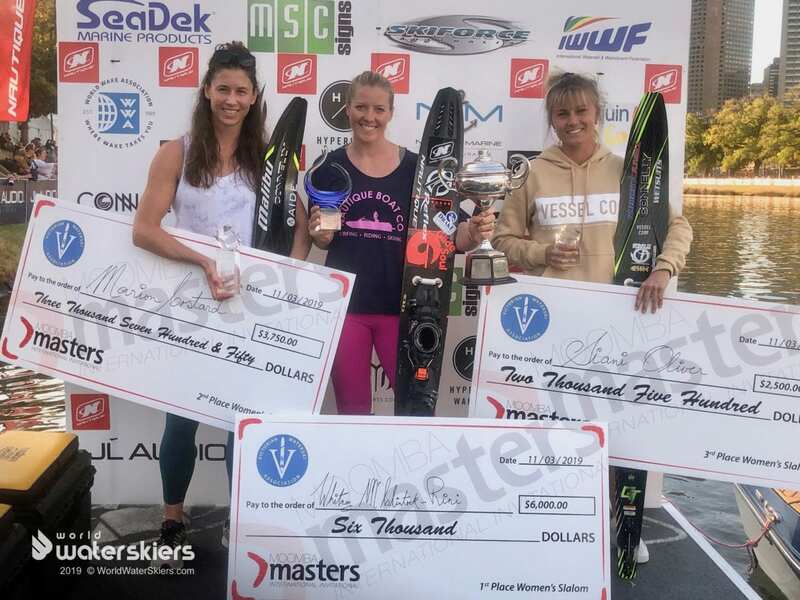 This should not be taken so lightly, as it is Jacinta’s 6th Moomba title in a row and she continues her winning streak on the professional circuit. Jacinta is continuing to prove that when the dust settles, she very well could go down as one of the top phenoms in all of professional sports. Lauren Morgan (USA) and Giannina Bonnemann (GER) blatted for the second spot. Giannina set the pace with an impressive 50.4m jump, but Lauren answered back on her last attempt with a 51.9m to take 2nd. 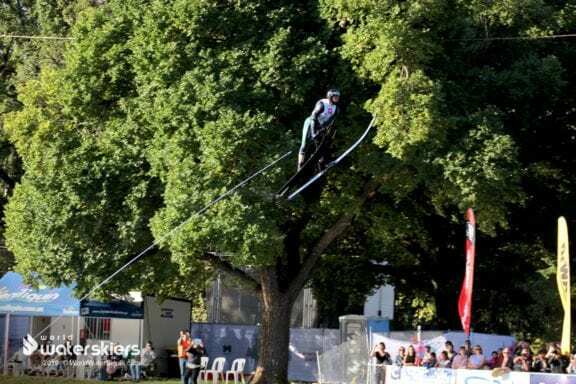 No one can be confident when it comes to the Yarra, but if anyone looked at ease it was Freddy Krueger (USA) in men’s jump. With the absence of defending champ Ryan Dodd (CAN), patiently awaiting the birth of his first child at home in Orlando, Florida, nobody was able to unthrone Freddy. Coming out in the 1st round, Freddy soared with a smooth 67m jump. The battle for second was fierce and the pace-maker in the finals was Rodrigo Miranda (CHI), who qualified in the 11th spot. Rodrigo nailed a 65.7m on his 1st attempt, but could not find the same timing on his final two attempts. Young gun Taylor Garcia (USA) looked rather impressive, not only taking home the Sunday Night Jump heat win over Freddy but by finishing with a 65.1m jump in the finals. Igor Morozov (RUS) consistency landed just shy of Rodrigo with a 65.3m, seemingly missing just a touch of kick-off of the ramp on each jump. 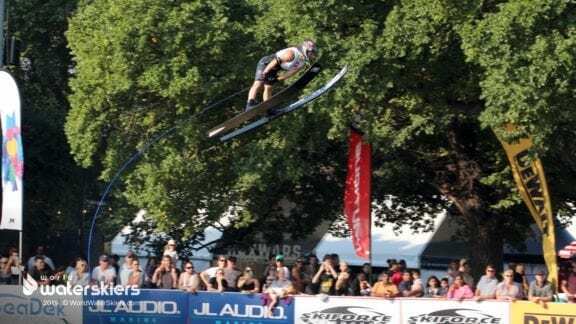 Knowing what he needed to do, Freddy picked a consistent line towards the ramp and demonstrated his amazing spring ability, comfortable flying to a 66.3m opening jump. With the sun setting, the top 6-night jumpers came back out to for one more chance at Moomba Glory. The jumpers battled to make the 1st cut, with 3 jumpers left standing. Igor, Freddy, and Taylor all posted jumps bigger than 62.7m and earned the privilege for yet another round on the river. With 2 jumps in the 2nd round, Igor leads off with a 62.6m jump. Having to watch patiently from the dock, Igor exclaimed, “It’s not as big a jump as I wanted, but you never know what could happen here on the Yarra, it might just be enough”. Garcia stepped up and claimed the first finals spot with a huge 64.5m, showing poise beyond his years. With Igor still hoping for a chance at the title, Freddy extinguished all hope with a 65.6m jump, once again finishing top seed. The final round would be determined by a one jump, head to head jump off. Taylor, knowing he would have to find something special to take down Freddy “the Nightmare” Krueger, nailed a 62.3m jump. While the jump was by no means his farthest, the distance was far enough for any jumper to realized that they need to bring forth their very best with only one chance at glory. But, once again, Freddy was dialed in and unleashed a 65.7m jump, the longest of the night, to wrap up this story.